I can't get by most days without using an exfoliator to cleanse my face because it's the only way to have my skin looking fresh and help keep the dry patches at bay. Now bead or pumice based exfoliators do become a bit too harsh for daily use so it's great that there are alternatives in the market. 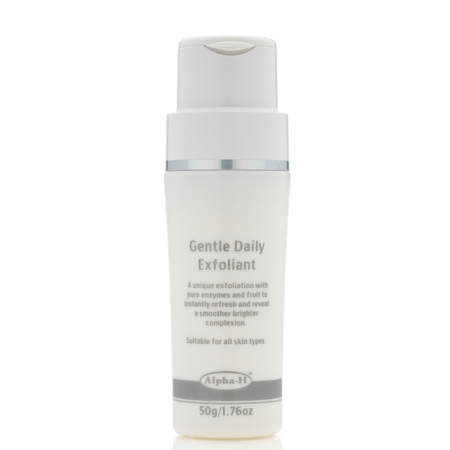 The best known one would be the powder based Dermologica's Daily Microfoliant and recently the SHE Red-Rice Exfoliating Powder and now Alpha-H has joined the market with its own unique version. Powder exfoliants are meant to be used on cleanse skin so don't use this with a face full of makeup. You should pre-cleansing face first or just use this first thing in the morning to avoid having to wash your face twice. Unlike other normal cleansers, these powder based cleansers are meant to be mixed with a tiny bit of water in your palm to make a smooth paste before spreading it onto your area of skin to be cleaned. It took a bit of getting used to for me to work out the right amount of water to use to get a nice thick paste - adding water drop by drop is key. 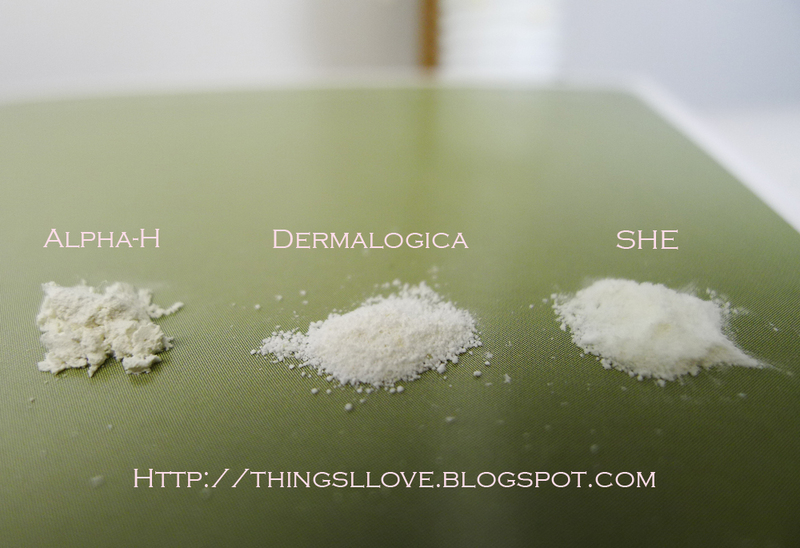 Is actually a clay powder based product compared to the other 2 powdered exfoliants. There is no odour when using this cleanser. Contains enzymes from pineapple and papaya extract which is activated upon contact with skin to do the chemical exfoliating work. After massaging it in circular motion for a minute to rub of dead skin cells, I use this as a mask by leaving it on my skin for another 4 minutes on a weekly basis for it to work as an enzyme mask to give me an exfoliating boost. Has only 6 ingredients: Kaolin, Sodium Diatomeae, Bentonite (another clay type), Carica Papaya Extract, Ananas Sativus (pineapple) Extract, CI 77891 (aka titanium dioxide) - I love simple products. I heart the smoothness of skin after use. blackheads are reduced and there is not a single dry patch in sight. Skin has a brightened complexion with a healthy radiance after 2 weeks; it's also very gentle and non-irritating even with the enzymes at work. The clay base also seems to help control oil production and I don't get as greasy anymore during the day. Rice powder based powder, it contains cellulose and can get clumpy in skin when over worked during the massage phase and is less smooth in texture than the Alpha H version. I'm a strong believer that simple is best but there are similar enzyme ingredients papain (c.f. Papaya extract from Alpha-H) in the lists. Very comparable to Alpha-H, giving soft smooth skin after use and does a great job with dry patches and black heads too. There is less skin brightening properties immediately after use and doesn't help with sebum control for me. If these aren't your concern then Dermalogica would be a better alternative as it is actually cheaper gram per gram to Alpha-H.
Is not an enzymed based power and instead has rice vinegar and lemon peel oil to refine pores. Texture wise, although the powder looked very similar to Dermalogica's microfoliant and is rice based, upon mixing with water you can tell it isn't as finely milled. There are actually minute grains of rice in this product and it works more like a scrub than a powder exfoliant when massaged on skin. Comes in a cardboard based container with no dispensing control mechanism so you will need to carefully pour your own amounts. I found this powder scrub quite harsh on my skin as the rice granules were very hard. It left my skin feeling smoother but also slightly raw and is definitely a poor comparison to the other 2 products. I would only recommend this product as a facial scrub and not a exfoliating powder so am disappointed with its misleading name. I would have to say the clear winner in my books is Alpha H, it doesn't get too clumpy when I over rub it onto skin; the clay base helps with oil control and it gives the best results in terms of skin softness and improved clarity. Dermalogica is a very comparable and close contender so its really up to personal preference on use of the two. SHE is at a lower class than the other 2 products and not very comparable in terms of texture of the product or the results achieve during use although it is alot cheaper in price as well. SHE is available at selected Priceline and pharmacies or online at SHE Australia online. Products marked * were provided for consideration. Others were purchased by me.